The Gizzarelli family was chosen to receive a new custom log home mortgage free for many reasons, but not the least of which is the fact that though Vincent is dealing with the after-effects of two tours of duty in Iraq, including debilitating head injuries and post-traumatic stress disorder, he, too, can’t sit idly by when he sees others in need. Recently, he and his wife, Jamie, have opened up their home to three foster children, ages 4 years to 23 months. They are currently in the process of trying to adopt them. Operation Finally Home, a not-for-profit 501(c)(3) organization dedicated to providing custom made mortgage free homes to wounded and disabled veterans, is building a log home for a wounded Marine and his family in North Carolina. You can help by buying a T-Shirt and Calendar from this website, which was built by Bevier Creative. For more information, visit Red, White & Blue Ridge Poker Run!. Who Benefits from this Charity Event? Buy a $15 calender--Gorgeous Gals for GI's--to help support the cause. All proceeds from the Red, White and Blue Ridge Poker Run benefit Operation Finally Home and its efforts to build a custom log home for a wounded Marine Sgt. Vince Gizzarelli and his family in Jacksonville, NC. All donations are tax deductible. It’s time to remember our servicemen and women who give everything for our country’s safety and our citizens’ freedom. But what happens when they find themselves wounded, discharged, and permanently disabled? The regimented lifestyle, the plans for a military career – it can all be taken away by a single bullet or piece of shrapnel. And yet, if you ask one of our wounded warriors if they would do it all over again, the answer is almost always “yes” without a moment’s hesitation. That’s why when members of the NAHB’s Building Systems Councils (BSC) learned that they could help a North Carolina Marine and his family, they, too, said “yes” without hesitation. The members of the BSC—manufacturers, suppliers, builders and industry professionals in the concrete, log, modular, and panelized home building industries–are designing and constructing a 3,000-square-foot custom log home in Jacksonville, N.C. The systems-built home will be located near Camp Lejeune—the largest Marine Corps base on the East Coast and a perfect fit for the Marine and his family who learned earlier this summer on the nationally syndicated radio show, “The Big Show with John Boy and Billy,” that they will receive it, mortgage free. Thirty-year-old Sergeant Vincent Gizzarelli and his wife were selected by the BSC’s partner in this project, Operation Finally Home — an organization founded by Texas builder, philanthropist, and 2010 CNN Hero Dan Wallrath when he realized that far too many of our wounded warriors were living in poverty upon their return to civilian life. He couldn’t sit idly by. The Marine and his family learned earlier this summer on the nationally syndicated radio show, “The Big Show with John Boy and Billy,” that they will receive a new log home, mortgage free. 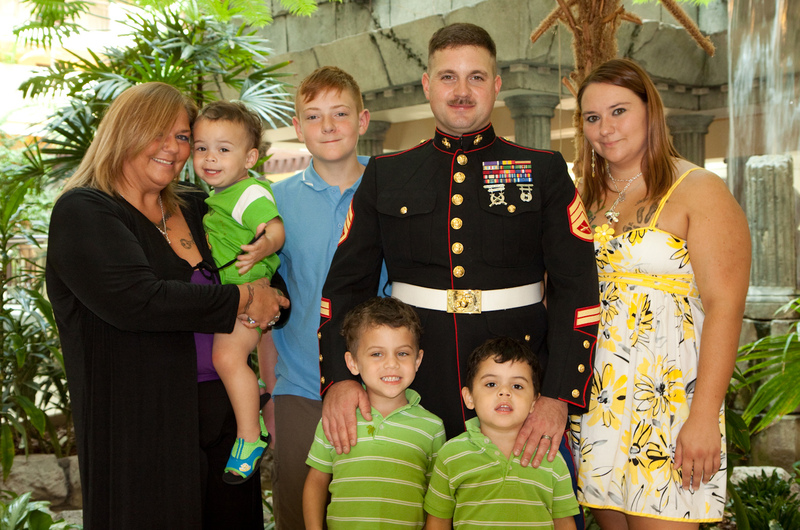 The Gizzarelli family was chosen for many reasons, but not the least of which is the fact that though Vincent is dealing with the after-effects of two tours of duty in Iraq, including debilitating head injuries and post-traumatic stress disorder, he, too, can’t sit idly by when he sees others in need. Recently, he and his wife, Jamie, have opened up their home to three foster children, ages 4 years to 23 months. They are currently in the process of trying to adopt them. The Gizzarellis’ new log home package is being provided by Log Homes of America, a North Carolina-based company owned and operated by Nicole and Joel Robinson. Nicole, along with Operation Finally Home’s Executive Director, Daniel Vargas, and BSC Associates Council Chair Roger Nelson of Andersen Windows, is also spearheading the coordination of the project.